Houseplants are beneficial to home and health. Houseplants have the ability to remove toxins from the air. Studies have shown that houseplants can remove 87% of toxins within a 24 hour period. Plants also have a soothing and calming effect on the body, helping people live healthier lives. Individuals who live in homes or who work in offices with plants have a 30% reduced chance of fatigue, coughs, sore throats, and other symptoms of colds. Not only do houseplants have benefits for air quality and health, but they provide beauty to the home decor. Assorted plants grace my home. How about yours? African violets, ferns, begonias, sweet potato vine, decorative pepper plants, scented geranium, ivy, and more fill home spaces and provide life to the decor. I've also been tending little trees. They are somewhat challenging at times, but well worth the extra attention. Ficus and variegated ficus trees are fairly common, but I love their shiny leaves and airy branches. They can grow to the ceiling and look great with little white lights added to their branches! This past year I added several other trees to our home. A camellia sinensis, commonly known as the source of tea leaves, is growing nicely in a pot, but it taking some tender loving care during the winter months. It appears to love sunlight, of which we have very little on some weeks these days. The coffee plant seems to thrive and is not particular as long as it receives water and natural light. And the lovely bay laurel tree is thriving! Winter hasn't seemed to slow it down and new leaves continue to be added to its splendor. Bay laurel is known for its aromatic qualities and the leaves are commonly added to soups and stews to enhance flavor. As January nears its end, I look forward to spring when the little trees can be set outside on the porch to grow in the sunshine again! What are your favorite houseplants? Do houseplants have a place in your home? You hit a happy chord here, my friend. I've recently lost or had to retire some very aged plants and I'm shopping for more than before. I love the look - and the benefit - of plants in my home. Very informative and good to know. I love to garden outside but I will have to admit that I have very few houseplants. I am going to have investigate this further and get some in my homes. Thanks and blessings! 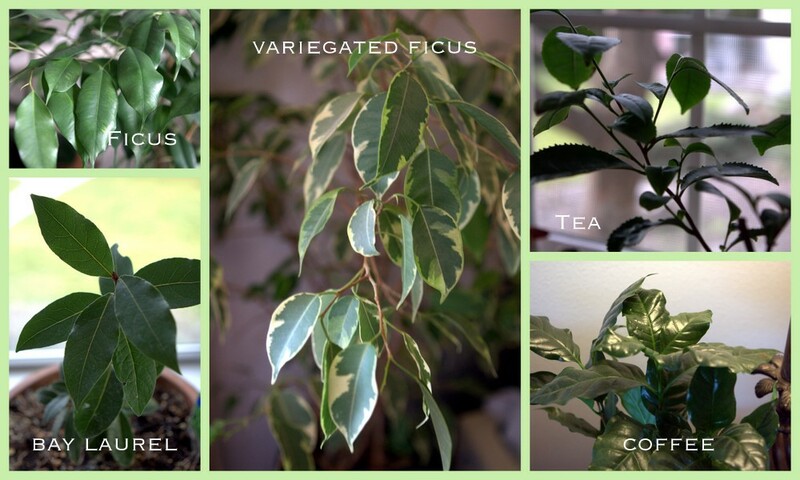 We also have several houseplants, one of my favorite is the ficus ! Some plants will go outside when the weather warms up, but right now we have a Meyer Lemon, Christmas Cactus, 3 orchids (2 are blooming right now),a small geranium, spearmint, 2 lemon verbenas, African violet, 3 little trees (don't know the name, but pretty), and one cactus. I am always happy to send them outside in the spring.